Car manufacturers often talk of the 'halo effect' of a flagship model. In short, it's spreading the glamour of a well-renowned car onto lesser lights in the range. There are any number of BMW 3 Series drivers who have fantasised about owning an M3 and when this marketing tactic is pursued well it can prove profitable. For a case study in the halo effect falling rather flat on its face, look no further than the Mitsubishi Lancer. To many, the Lancer is the Lancer Evo, the all-wheel drive, turbocharged rally replica that comes laced with a heavy dose of Tommi Makinen forest stage heroics or Police, Camera, Action starring roles, depending on your viewpoint. The Evo didn't create a halo effect. It was so incandescent it cast the rest of the ordinary Lancer range into the darkest shadow. All of which was a bit of a shame as by the time this generation Lancer appeared in British showrooms in 2008, it had developed into a more than respectable car; certainly something that was a bit more interesting than the usual Astra/Focus/Megane norm. Here's what to look for if you fancy giving it a second chance, second time round. You could see what Mitsubishi was trying to do with this generation Lancer model. With the benefit of hindsight, it probably wasn't a good idea to try to ape Subaru's tactic in going mainstream and locking horns with the might of Ford, Vauxhall, Toyota and Renault. That sort of tactic requires a serious development and promotional budget. Mitsubishi and Subaru didn't have either. The pinch of the global economic crisis also meant any new cars were hard to shift. Those two factors probably did for the Lancer as a mainstream contender before it ever turned a wheel in the UK, but you can't fault Mitsubishi's efforts to interest us. The range initially consisted of Sportback hatch models in GS1, GS2, GS3 and GS4 trims, with saloon models also offered in the top two variants. Buyers chose from a 110PS 1.5-litre petrol engine, a 144PS 1.8-litre petrol unit that was also offered with a CVT transmission, or a 140PS 2.0-litre DI-D diesel. A 240PS Ralliart five-door was also briefly added to the range. A four-door SE model was added to the line-up in summer 2009, powered by the 1.5-litre petrol lump. The saloon models were also later quietly shelved. Mitsubishi attempted to spark interest in the Lancer with its '5-4-3-2-1 Deal' in early 2010, which included 5 years free servicing and breakdown cover, 4 years 0% APR, a 3 year warranty, and 2 years road fund licence. The range got a 2.0-litre DI-D Juro special edition in late 2010 and a 1.5-litre Juro model, based on the GS2, in January 2011. A big part of the old Lancer's problem was that it looked so staid. This time round, Mitsubishi wasn't making that mistake. Even the entry-level model looks sharp, with the aggressive, squinting front end and the rising waist line giving it a pugnacious stance. The car is built on a longer wheelbase and a wider track than its predecessor, although it's marginally shorter in overall length. A big draw was the improved interior quality. The plastics and design are still probably a notch below the best in this price bracket, but they're no longer leagues off the pace as they were in previous generation models. The cowled instruments are a nice touch. Space inside is better than you might expect thanks to the wheelbase and track increases but the Sportback version is no cavernous load lugger, the steeply raked rear end impinging on carrying capacity. Score one to the stylists. We'd stretch to the 1.8-litre petrol unit over the 1.5 if at all possible. The diesel's well worth considering too, but only if you're likely annual mileage will justify the price premium being asked. Equipment levels are very strong, all models coming with air conditioning, twin front, side and knee airbags, a trip computer, electric windows all round, a rear spoiler and a CD stereo with MP3 capability. With the price advantage that the Lancer enjoys over some of its key rivals however, you may find yourself being able to stretch to one of the plusher models that come dripping with extra features. To give you an example, the top of the range version comes with a Pan-European HDD satellite navigation system with colour touch screen, a 30GB music server, heated leather seats, iPod input, a personalisation set up and an advanced vehicle data system. That's an unbeatable kit list. The good news about the Lancer is firstly that it's extremely well screwed together, secondly that the warranty and servicing arrangements tended to lead the cars to be well looked after and thirdly that - Ralliart version aside - they tended to be bought by more mature customers. Just how reliable is it? Unbeatable in fact. In 2010, the Lancer was revealed as the most reliable car of the last 15 years, according to automotive warranty specialist, Warranty Direct. The company studied more than 200,000 live and historical policies to create its Reliability Index, which became an industry benchmark for used car reliability, using a complex formula to rank more than 450 individual models, taking into account factors such as how often the car breaks down, how much it costs to repair, plus average age and mileage. In the number one spot, and by quite some margin, is the Lancer. If you want the most bullet proof used buy around, well this is it. With the Ralliart model, you'll need to give it a more thorough inspection for crash damage, tyre wear, SST gearbox function and oil servicing. (Based on a 2010 Lancer 2.0 DI-D) Budget about £275 for a replacement exhaust from the front to the catalyst, while a new clutch will be around £180. An alternator should be around £185. A new wing mirror is in the region of £135, while a headlamp is a hefty £260 and a starter motor around £160. Now at this point, you might be expecting me to say that you're getting a good chunk of the driving manners of the Lancer Evo X at a fraction of the price - but I think you're smarter than that. With a car packing a 1.5-litre petrol engine that cranks out just 109bhp, those comparisons aren't going to wash for too long. It's a fairly willing motor but 60mph is still 11.4 seconds away (or a yawning 14.3s with the auto box). A better bet is the 1.8-litre VVT unit with 143bhp and a zippier 9.6s sprint to 60mph. This comes with a five-speed manual or the option of a six-speed CVT 'box. Significantly, there's also a punchy Volkswagen-sourced 138bhp 2.0-litre DI-D diesel that's just as quick but offers a lot more torque. So you're not getting Evo style go, but the steering feels much the same, the cabin is very similar and the Lancer feels very composed at speed, helped by chassis that is 56 per cent stiffer than its predecessor in torsional rigidity. There's also a clever Active Stability Control system that reduces rotational movement when the vehicle begins to skid. You don't get four-wheel drive in the way that you do in a comparable cheap Subaru Impreza, but the front-wheel drive chassis is nimble and traction control is offered. 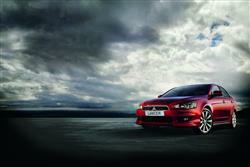 The Mitsubishi Lancer earns its spurs as a used car because of its peerless reliability. How do you put a price on that? The 2.0-litre diesels are a great pick and the practical Sportback bodystyle still looks great. The 240PS Ralliart sports version is an interesting niche model that flies under the hot hatch radar and makes a great left-field alternative to something like a Focus ST. In all, the Lancer earns a solid recommendation. It may not have done the business for Mitsubishi as a new car but as a used one, it could well work for you.